Lili love la vie, Liliane Bruneau, outstanding business woman! is the title "Dame Plume" gave to her book. 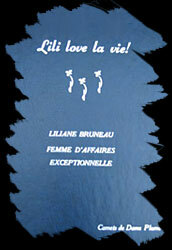 The book is a specially written book on Liliane Bruneau's career. Les carnets de Dame Plume offer guidance and support for your writing project, with the utmost respect for its content. For limited editions, with or without pictures. Writing, transcription, revising and proofreading of manuscripts or recordings. Biographies, souvenir books (friends, family, passions, travels, etc. ), special projects. If you have a hidden treasure, Dame Plume wants to know. A gift, for yourself or others. Package or hourly rates.